It’s not a cheap-as-chips impulse buy, but for any player drawing on 50s and 60s tones - and quite a bit more - with a matching aesthetic, we’d recommend auditioning this piece. A ‘serious’ price point, but in line with other similar quality brands. There aren’t too many brands that capture the retro-modern zeitgeist quite like Fano’s Alt De Facto artful relics. While Dennis Fano is no longer involved in his eponymous brand, and has subsequently created Novo Guitars, a further twist comes with this new joint venture that utilises his design with Eastwood Guitars’ Asian manufacturing to create a temptingly affordable slice of retro. 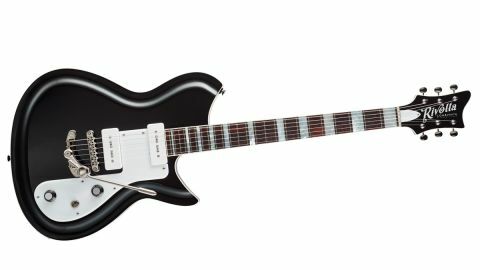 Currently, there are two Rivoltas that differ in just their offered bridge: the Combinata Standard has a compensated wrapover bridge, while our Combinata Deluxe Trem swaps that for a roller saddle tune-o-matic-style bridge and Duesenberg’s Les Trem II - a rather nifty design that’s a reversible replacement for a Gibson-style stud tailpiece. The Combinata itself is based on Fano’s RB6 (modelled on Rickenbacker’s Combo from 1954), but the body is slightly upsized to 356mm (14 inches) wide with a subtly offset waist, 635mm (25-inch) scale length and 24 frets. It’s a very tidy build. The finish looks ultra shiny, the scratchplate and pickup covers a bright white in stark contrast. The slightly creamier coloured binding is cleanly scraped on top and bottom edges, while the outer ‘German carve’ reduces the rim to 37mm making the body appear thinner than its overall depth of 45mm. Despite the increased body size, weight is kept under 3.6kg (8lbs) thanks to the ES-335-like centre solid section and airy hollow wings. Aside from the company calling the pickups Novanta (‘90’ in Italian), we don’t get any info on the soapbar single coils, but under the white covers they appear tidily made in pretty classic P-90 style. DC resistance edges on the hotter side - 9.03kohms (bridge) and 8.18k (neck). A nice touch is the gig-ready, side-placed output jack mounted on a rigid metal plate. To be picky, there are noticeable file marks on the nut, the fingerboard binding is a little sharp-edged and, although the fret tops are finely polished to a mirror-like sheen, a few of the fret ends are left a little rough. Still, it doesn’t ruin the fun. Strapped on, the balance is perfect, aided by the upper strap button that sits just inside the top horn. It is a 24-fret guitar, the neck joins the body at the 17th fret, and thanks to a nicely shaped and slightly offset heel, access to the top fret is pretty easy, certainly for a single-cut. The neck is equally sorted: a nicely tapered C that is a hearty handful by the time it moves into the heel. Frets, too, are pretty wide and low (around 2.69mm by 1mm), which, with the supplied low setup on the relatively flat ’board, imparts a modern, quite slinky playability. Listening clean, the soapbars seem to strike a balance between jangle and raunch, helped no doubt by the thinline construction. The hum-cancelling pickup mix might be a reason alone to buy this guitar, while the bluesier neck pickup sounds quite stately and mature. Any roots leadlines seem to work on the back pickup: less spiky than a Strat, less honky than a Tele and not as gnarly as a Supro. It takes pretty much everything into its stride that its style suggests: ringing early Who aggression through a cranked lil’ Vox AC10, to more Ricky-like jangle with just a little roll off from the tone. Using the dual amp setup of Yamaha’s THR Dual head really suits with bags of chime from a cleaner amp voice mixed with a really quite gained Marshall-y voice mixed underneath. The vibrato does a brilliant impersonation of a Bigsby once you tighten the grub screws to hold the arm in place. When the strings are stretched and settled (we added a little lube to the nut grooves, too), stability is excellent. We’re awash with vintage and funky-looking retro guitars, be they reissues of originals or, as here, inspired by a guitar from the past. Whether or not you get the aesthetic, this is a well tuned-in guitar. Its vibrato is perfect for Bigsby-like shimmer and, combined with these soapbars on its semi-solid body and a hugely playable neck, you have all the hallmarks of a modern boutique build at a very smart price.